The main mining areas were on the south side of the Yarra from Black Flat to Gold Memorial Drive. Many claims were spread around the Fourth Hill area from Whipstick Gully to Anderson's Creek. Is that which has eroded put of reefs and washed down into rivers and creeks. It was also found in many gullies, such as Specimen, Whipstick, and Ross. Most alluvial gold was worked out of the gullies by the mid-1850s. These were used for alluvial mining and built along the shallow sections of the Yarra. The walls were made from two parallel rows of saplings, separated and reinforced with stones. The water was drained out of the box with “California pumps” leaving the riverbed clear where it could be scraped for alluvial gold - a wooden dam built by driving piles into the riverbed so soil on the bottom could be washed for gold. Used as early as 1856 – some remnants remain. Became practicable when machinery to crush the rock was improved, using crushing batteries. There was a shift from individual miners to company mining. Gold was embedded in rock and found in lines, reefs or veins in quartz in the ground. Reef mining continued until the Caledonia mine closed in 1912. See the printed publication : "Digging into History - Goldmining in Warrandyte", by Diane Baird, 2007, available from the Warrandyte Historical Society. 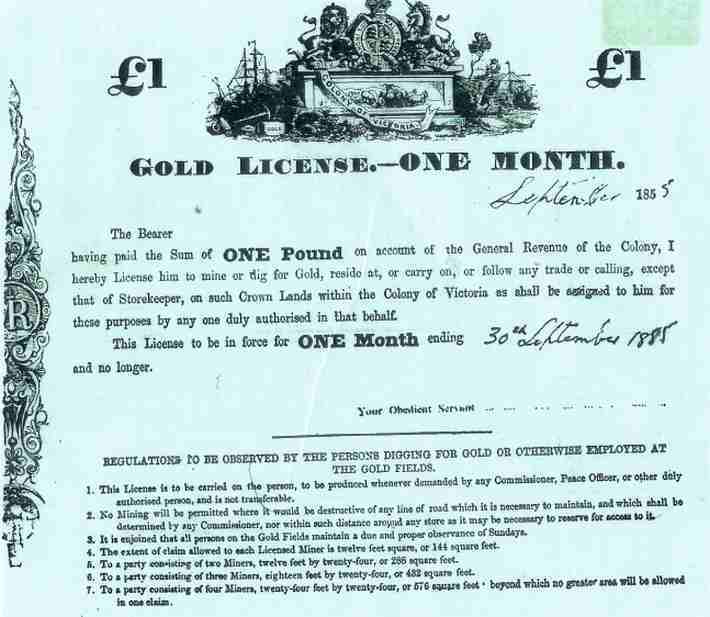 1855 Mining Licence, valid for one month!